Las Vegas, a glitzy city well-known for its big winners, seems like the perfect place to announce the finalists in a competition created to find a way of improving the lives of millions of people with low-limb paralysis. The million dollar global Mobility Unlimited Challenge is a partnership between the Toyota Mobility Foundation and Nesta’s Challenge Prize Centre and the CES 2019 tech show has been used to showcase the last handful of finalists. The eventual winner, who will be notified in September 2020, stands to get a real boost, not just financially but because of the high-profile nature of the big guns behind the competition. Nesta is a global innovation think tank, while Toyota Mobility Foundation was established back in 2014 to support the development of a more mobile society. Their collaboration for this three-year challenge has seen the development and evolution of some great new tech. Now the judging panel has selected five finalists, using the backdrop of CES 2019 to highlight the hard work of the assembled teams. They include entrants from the UK as well as the United States, Japan and Italy, and each one has received a $500,000 (about £400,000, AU$700,000) grant to help them develop their idea thus far. On top of that, the eventual winner stands to receive a substantial $1 million funding grant to get their brainwave from concept to production. 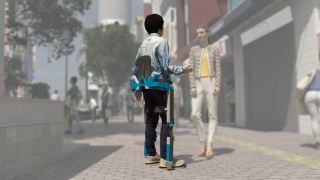 Entrants were tasked with coming up with game-changing designs that would help improve the mobility and independence of people with lower-limb paralysis. First up is the Phoenix Ai Ultralight Wheelchair from the Phoenix Instinct team based in the UK. This is an ultra-lightweight, self-balancing, intelligent wheelchair, which its creators say helps to eliminate painful vibrations. Using smart sensors, the chair will configure itself to what the user is doing, so it remains in sync with how the user moves. It will have many smart functions never before seen in wheelchairs. For example, there will be intelligent, lightweight power assist to help make slopes easier to ascend. Next, there’s the Evowalk, from American team Evolution Devices. This is a non-intrusive sleeve that goes around the user’s leg and has sensors that track walking motion and stimulate the right muscles at the right time to improve mobility. This personalised, timed muscle stimulation will also, says the development team behind it, help to rehabilitate muscles over time. Meanwhile, Italdesign, another European entry from, unsurprisingly, Italy, has created the Moby, which it says is the first mobility service created for wheelchair users, operating like a cycle share scheme in urban hubs. The concept involves offering a series of wheel-on electric devices with the objective being to make travelling around cities much simpler and easier for people with lightweight manual wheelchairs. The service will be accessible via an app-based share scheme. Japan has a team called Qolo (or Quality of Life with Locomotion), from the University of Tsukuba. The Qolo is effectively a mobile exoskeleton on wheels, which helps users to sit or stand with ease. Cleverly, this means that the team is removing the ‘chair’ from ‘wheelchair’. Mobility is controlled using the upper body, allowing hands-free operation. The device enables users to travel around in a standing position, changing both physiological and social aspects of everyday living. Last, but not least, there is American entry Quix, from the IHMC & MYOLYN team, which has created another highly mobile, powered exoskeleton offering fast, stable and agile upright mobility. Quix uses modular actuation, perception technology from autonomous vehicles and control algorithms for balancing autonomous humanoid robots to deliver the mobility, safety and independence that existing exoskeletons aren’t currently able to deliver. It’s been a long, hard road for the entrants, which have been whittled down from a total of 80 initially, coming from no less than 28 countries. They’ve also been under intense scrutiny from the judging panel, which features the likes of the UK’s Sophie Morgan, a television presenter and disability advocate along with Ruth Peachment, an occupational therapy clinical specialist at the National Spinal Injuries Centre.